Francesco Preziuso first appears in the Painesville, Ohio, area in 1900. In America, Francesco Preziuso was known as Frank Preziuso. Francesco Preziuso, son of Giovanni Preziuso and Caterina Mainella, was born on May 11, 1882, at Frosolone, Italy. He married Maria Assunta Iovine, daughter of Leonardo Iovine and Domenica DiCristofaro, on October 10, 1909 at St. Mary Catholic Church at Painesville, Lake County, Ohio. 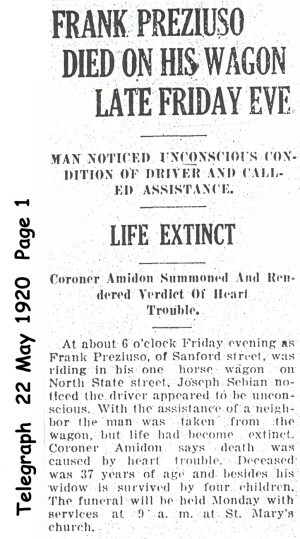 Francesco died on May 21, 1920, at North State Street, Painesville, Lake County, Ohio, at age 38, from heart trouble. His body was interred at St. Mary Cemetery at Painesville Township, Lake County, Ohio. Francesco Preziuso, age 18, first immigrated to the United States on August 2, 1900, travelling to Painesville, Lake County, Ohio. He temporarily returned to Italy in 1908. Francesco is shown as re-entering the United States on March 8, 1909. He was returning to Painesville, Ohio. He was travelling with his sister, Domenica Immacolata Preziuso, and her husband, Liborio Padula. Frank Preziuso became a citizen of the United States on June 14, 1915. He resided at 222 Storrs Street, Painesville, Lake County, Ohio, when he was naturalized. At the time of death, Francesco resided at Sanford Street, Painesville, Lake County, Ohio. 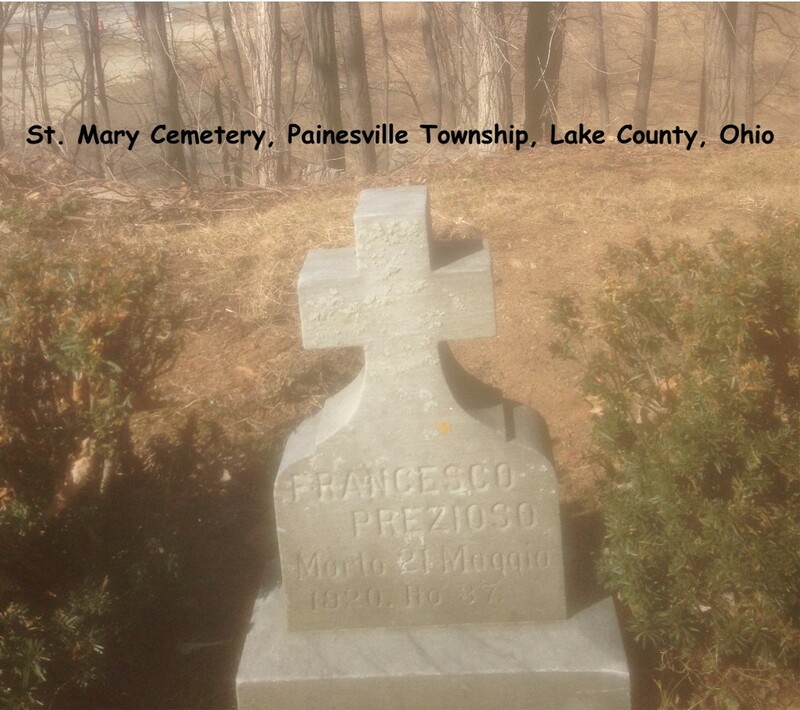 Three of Francesco’s siblings also lived in Painesville, Ohio. Brother Felice Preziuso immigrated in 1896. Brother Giuseppe Nicola Preziuso immigrated in 1906. Sister Domenica Immacolata Preziuso immigrated in 1909. How Francesco Preziuso was related to other Painesville Italians, Antonio Preziuso and his brother, Giovanni Preziuso, is not exactly known. Antonio is cited as a cousin of Francesco Preziuso on a passenger ship manifest. When he first immigrated to the United States, Francesco was employed as a laborer working for a nursery, probably the Storr’s and Harrison’s Company. At the time of his death, Francesco was employed by the Diamond Alkali Company.